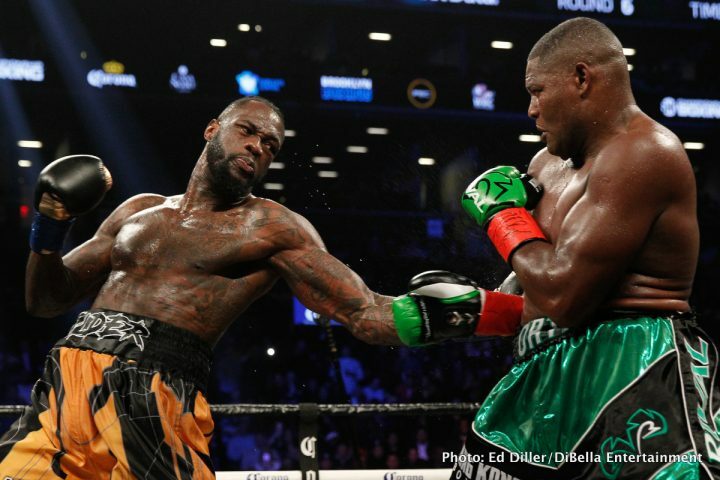 By Scott Gilfoid: Deontay Wilder says Anthony Joshua never wanted to fight him, and that’s he’s a “coward” for not facing him in a unification fight. Wilder says Joshua wasted three months by taking up a fight against him, but then failing to take it. After the negotiations with Wilder fell apart this week, Joshua (21-0, 20 KOs) will be defending against his WBA mandatory challenger Alexander Povetkin next in September. Wilder says Joshua’s promoter Eddie Hearn never gave a date or a venue for the fight with Joshua, and that the rematch clause in the contract only applied to Joshua and not to him. Wilder says he’s going to get the last laugh when it comes to Joshua. However, just how Wilder (40-0, 39 KOs) plans on doing that is unknown. There aren’t other popular fighters in the heavyweight division for Deontay to fight aside from Joshua. If Wilder beats all the top guys that Joshua has been beating, he’s not going to get the same response from the U.S boxing fans, because they’re not impressed with guys like Dillian Whyte, Joseph Parker, Eric Molina and 41-year-old Wladimir Klitschko. Whether he wants to admit it or not, Wilder needs Joshua to increase his popularity. He’s not going to have the boxing fans eating out of his palm by beating the same fighters that Joshua has been padding his record with. The U.S fans want to see quality from fighters. They’re not impressed with wins over fodder opposition. Joshua’s next fight against 38-year-old Povetkin will do good numbers on Sky Box Office PPV, because the Russian fighter is an accomplished former WBA heavyweight champion and he’s also an Olympic gold medalist. Povetkin impressed a lot of boxing fans in the UK recently in destroying David Price in five rounds last March. Povetkin’s powerful fists did a lot of damage to Price, causing him to suffer cuts that required 42 stitches to close. The 6’2” Povetkin could do similar damage to Joshua’s face if he’s able to reach him with his shots. Of course, if Povetkin is unable to reach Joshua, it could be difficult for him to land anything at all. If Povetkin has the bad luck of having a referee that prevents inside fighting, as Joseph Parker did in his fight against AJ last March, then his chances of success go way down. Povetkin wouldn’t be prevented from fighting in close for the entire fight, but he would need to make the most of his opportunities before the referee pulls him and Joshua apart. negotiations once again, especially if he Joshua-Povetkin fight brings in huge PPV numbers on Sky Box Office. Hearn can lowball Wilder indefinitely if Joshua’s fights continue to bring in huge PPV numbers in the UK. Joshua’s fight against Povetkin likely won’t attract much interest in the U.S from the casual boxing fans, but that doesn’t matter. All Joshua needs is to keep bringing in the gravy in the UK for Hearn to lowball Wilder forever. At some point, Wilder will need to make a decision whether it’s worth it to deal with Hearn and Joshua, because he’s going to need to swallow his pride if he’s to agree to all the things that they’re going to want in their favor. The $15 million flat fee that Wilder is rumored to have agreed to for the Joshua fight is just one example of how tilted the negotiations were in AJ’s favor. Assuming the Joshua-Wilder fight rakes in $100 million, Joshua would walk away with $85 million to Wilder’s $15 million. The purse split would be 85-15 in Joshua’s favor. That’s embarrassingly bad. For Wilder to agree to a lopsided purse split like that must have been really tough for him to do. Wilder had already agreed to fighting Joshua in the UK. Giving up home country advantage had to be tough for Wilder given that his management made a $50 million offer to Joshua for the fight. Joshua is going to be fighting arguably an easy mark in Povetkin in his next fight. If the negotiations with Wilder are still a one-way deal in Joshua’s favor, then it’s quite possible that the boxing public won’t see a fight between them in the first half of 2019. Hearn has other options for Joshua once he gets Povetkin out of the way. Hearn wants to put together fights between Joshua and Dillian Whyte and Jarrell ‘Big Baby’ Miller. There’s also a rematch with Joseph Parker that could be of interest for Joshua if he defeats Whyte in their fight next month on July 28.